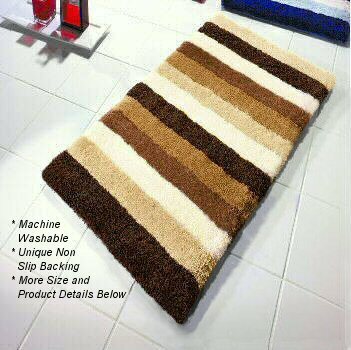 Luxury striped contemporary bath rug with a dense high pile 25mm / .98in. Designed and produced by well-known German brand Kleine Wolke, established in 1968, and is backed by their quality guarantee.. Individually tufted and made of long wearing, durable polyacrylic yarn. Blue : Beautiful striped bath rug with a high dense pile. Colors range from white, light blue and medium tone blue to royal blue and very dark blue. These are true blue tones. Beige : A great center piece that will add elegance to any bathroom. The color range includes white, beige, medium caramel brown, mahogany and deep dark nut brown. Cashmere : Absolutely striking color scheme. This color is perfect in a spa themed bathroom. Includes white, medium brown, taupe tones, tan and charcoal grey. Chili : What a fun bath rug color. The range of colors include white, charcoal grey, deep burnt orange, and lighter orange tones. Due to the number of color options coordinated lid covers are available upon request. The Bilbao lid cover is $32.99. Bilbao elongated lid covers are a solid color.